When you begin care with us, we will discuss our best recommendations to help you meet your goals. We customize our approach through a variety of different ‘techniques’, and have many ‘tools in our tool box’ to address your concern appropriately. 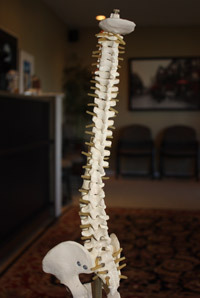 Spinal joints that are not moving right can choke or irritate nearby nerves. Chiropractic adjustments add motion to these stuck joints, reducing pain and nervous system disruption to allow your spine to heal. A Chiropractic adjustment can be done in a few different ways. Sometimes a specific highly-accurate thrust is used, other times it may be a slow constant pressure. Several areas may be adjusted, or just one and sometimes a popping sound is heard. Whichever approach we use, our goal is to improve your body’s motion and function. One of the most sought after soft-tissue techniques in the world today is ART. When a muscle tightens up; whether through repetitive motion, or after injury – swelling occurs, limiting oxygen to the muscles and connective tissues. This causes scar tissue to form, which can decrease the flexibility of a muscle or joint. It can also adhere to nerve bundles, leading to symptoms such as tingling, numbness or pins and needles. An ART® treatment works the injured area through its full range of movement while specific contacts are applied to release the adhesion formation. Custom orthotics are biomechanical medical appliances that are custom made to correct your specific foot imbalance. They work on your feet much like glasses work on your eyes- they reduce stress and strain on your body by bringing your feet back into proper alignment. During pregnancy your body is going through many changes – physical and emotional. In fact 50% of pregnant women will experience back pain. Additional weight, changes in posture and hormones may all contribute. Chiropractic care can help keep you comfortable as you and your baby grow. Chiropractic care is for all ages! Kids fall all the time, and it’s well known that many children suffer from back pain and headaches. Chiropractic adjustments for children and babies are very gently and most kids enjoy their visit. Make wellness a family affair! Have you been in an MVA? Even low-speed collisions can produce significant damage. We take great pride in returning our patients back to pre-accident status as soon as possible. Chiropractic care has been recognized as an important component in whiplash type injuries. We are here to help you understand the paperwork process and reduce the stress of dealing with an injury. For pain relief, restoring muscle motor patterns, reducing scar tissue, and retraining and strengthening soft tissue, we often incorporate essential rehabilitation exercises into our care. Graston – Graston is an Instrument Assisted Soft Tissue Technique in which the goal is to improve blood flow and tissue mobility throughout the injured area. This allows proper healing and function to return and can be used for both acute injuries as well as long standing chronic conditions. This technique is very effective for many sports injuries and chronic conditions such as plantar fasciitis, tennis elbow, achilles tendinopathy, and post surgical scars.